It not only takes a village to raise a child; it takes a whole community to host an Annual Conference. At least it did in the nineteenth century. This was never more true than when as many as sixty thousand visitors crowded into the tiny town of North Manchester for the great Brethren's Annual Meeting of 1900! The population of North Manchester was about four thousand at the time and the entire county (Wabash County) had barely thirty-thousand. This was certainly the largest crowd at any Annual Conference at any time, and the largest gathering for a religious meeting in the State of Indiana up to that time. In the early years the Big Meetings were hosted by individual congregations, with help from neighboring churches as needed. Because of its location at the intersection of three major railroads, North Manchester was a suitable site for the conferences. Three conferences of note were held here during that period; 1878, 1888 and 1900. Twice later (1926 and 1945) conferences were held in North Manchester, but by then the conferences were planned and conducted by denominational agencies and commercial centers were usually chosen as sites for the meetings. Because of the huge crowd, preaching services were scheduled in a number of the community churches. At the 1878 conference, Sarah Major was chosen to preach at the Lutheran church. Perhaps because of the novelty of hearing a woman preacher (she was likely the first woman preacher to appear in North Manchester) the church was filled to overflowing. The local newspaper said, "The anxiety to hear her was so great that only a small number of the vast crowd that went could get into the church." At least 1500 teams (horses and buggies or wagons) were offered by the community to transport visitors from one place to another. At least fifty-six train coaches full of delegates arrived for the meetings. In 1888 huge tents were erected in a wooded area adjacent to the fairgrounds to provide for meetings places and eating places. Electricity and running water were installed on the grounds. One of the railroad companies constructed a plank walkway from the depot to the conference grounds. The most notable incident occurred when James Quinter, President of Juniata College and editor of the Gospel Messenger, was to speak. Quinter was by far the best-known Brethren leader at that time. Otho Winger, later President of Manchester College, said, "The greatest desire of my heart was to see and hear Elder James Quinter." Before a huge crowd, Quinter was leading in prayer when he suffered a stroke or heart attack and died on the spot. But the 1900 Annual Meeting was the biggest and most spectacular of all. The Conference grounds were set up in the east end of Harter's Grove, where the present Warvel Park is located. Five carloads of lumber (100,000 board feet or more) were bought to construct buildings for conference use -- a tabernacle 100 x 120 feet, a dining hall 60 x 120 feet, and a lunch room 18 x 150 feet were the largest. Again, electricity and piped water were supplied. About 100 tents were set up in the grove nearby. Most people stayed in homes of the citizens of North Manchester and the surrounding rural areas. "Many houses in town accommodated twenty and thirty and even as high as forty lodgers in a night, and there was hardly a residence without someone." Some charter trains were left parked near the conference grounds so passengers could sleep there. A special forty-car excursion train came from Dayton, Ohio, just for Sunday, June 3. The Sunday crowd was truly extraordinary. A newspaper account stated, "early in the morning rigs of all descriptions began to arrive from the surrounding country and neighboring cities, towns and villages. Carriages, buggies, road-wagons, spring wagons and farm wagons filled to overflowing came pouring in from every direction, and each was loaded to its utmost capacity. The streets and sidewalks were soon little less than a great moving mass of activity.. . . By noon there were at least 45,000 people in the grove and scattered through the city." Total estimates of 50,000 to 60,000 were heard. The support and cooperation of the businesses in North Manchester and the surrounding area was almost complete, as well as the participation of almost all residents of the community. Of course, the returns to the community in terms of money and publicity was extensive. " It has taken an immense amount of provisions to feed this great gathering, but so far as we are able to learn, all were provided for, though it taxed the town to the utmost." (side one) CHURCH OF THE BRETHREN FOUNDED IN 1708 IN EUROPE. BY 1778, BRETHREN MET ANNUALLY TO DETERMINE CHURCH POLICY. 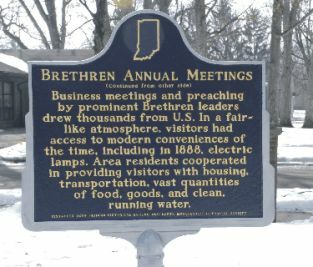 FIRST ANNUAL MEETING IN INDIANA WAS IN ELKHART COUNTY 1852. NORTH MANCHESTER CHURCH OF THE BRETHREN HOSTED ANNUAL MEETINGS 1878, 1888, 1900; LAST TWO MEETINGS HELD HERE IN HARTER'S GROVE. HAD ENORMOUS SOCIAL AND ECONOMIC IMPACT ON AREA. (side two) BUSINESS MEETINGS AND PREACHING BY PROMINENT BRETHREN LEADERS DREW THOUSANDS FROM U.S. IN A FAIR-LIKE ATMOSPHERE, VISITORS HAD ACCESS TO MODERN CONVENIENCES OF THE TIME, INCLUDING IN 1888, ELECTRIC LAMPS. AREA RESIDENTS COOPERATED IN PROVIDING VISITORS WITH HOUSING, TRANSPORTATION, VAST QUANTITIES OF FOOD, GOODS AND CLEAN, RUNNING WATER. The marker was presented to the town and dedicated on Friday, August 11, 2006. About 150 persons heard a choir of local singers present some favorite old-time hymns, heard a talk by Sarah Major (aka Joan Deeter), witnessed the unveiling of the marker and heard further remarks by Ms. Paula Bongen of the Indiana Historical Bureau, Ferne Baldwin, president, North Manchester Historical Society, Don Rinearson, president, Town Council, and Kurt Borgmann, pastor, Manchester Church of the Brethren. The marker is located in the park just off seventh street, the actual site of the 1900 Annual Conference. After this ceremony, about seventy people gathered at the North Manchester Center for History to hear an illustrated lecture on "The Social and Economic Impact of the Brethren Annual Meetings in North Manchester" by Bill Eberly. Three railroads made North Manchester a transportation center. The Detroit, Eel River and Illinois R. R. (later known as the Vandalia) reached N. Manchester in 1871. Cincinnati, Wabash and Michigan R. R. (known as Big Four) was completed in 1872. Chicago and Atlantic R. R. ( Erie R. R.) came in 1883. The first two crossed in North Manchester and the Chicago and Atlantic south of town on a line from Ijamsville to Servia. The Headquarters for the Conference were at what is now known as the West Manchester church. A large frame tabernacle, 272 feet by 80 feet wide was constructed. One half was used for meetings and the other half for dining. After the conference, the land was donated for use as a cemetery, now the Pleasant Hill Cemetery. The dining hall was a large tent 67 feet by 100 feet with tables and benches built as combined units. A tent 100 feet by 140 feet, seating at least 5000 was used for meetings. There were electric lights on the grounds as well as water throughout the grounds. Thirty head of cattle were fattened specially for the meeting and averaged 1200 pounds. The dining room served eight tons of bread, 2000 pounds of butter and many barrels of potatoes, eggs, pickles, sugar, coffee, tea, rice, salt, pies, cakes and buns. The welcome was signed by fifty local citizens and read: We, the undersigned citizens of the town of North Manchester, by the consent of the committee of arrangements, request that the Rev. R. J. Parrett deliver an address of welcome to our German Baptist friends at their coming annual conference. The Welcome by Rev. R. J. Parrett read: "I esteem it a great honor to be chosen by my friends in harmony with the wishes of your committee to deliver this address of welcome to you. It is with no little degree of interest that we have all looked forward to this great national gathering. We have as citizens in common felt a degree of pride because of the consideration given us as a community, and the preference shown in deciding to hold your annual meeting here. Indeed we feel like complimenting your committee for the good judgment displayed in the selection of a place, North Manchester being the "Mecca" of the United States, with her splendid railroad facilities, unsurpassed for their kindness and generosity, situated in the richest of agricultural valleys on the banks of one of the purest and most beautiful rivers, with population of church-going and peaceable citizens known by all who ever pass this way for their charity and liberality. The preceding is a brief statement of the meeting of one of the strongest religious bodies in the country and one of the largest gatherings ever held in our state. Our citizens should extend an open-hearted welcome to all and use every effort to make it a pleasant meeting to all so that North Manchester will be long remembered in the hearts of the visitors with feelings of gratitude." "Will publish a daily edition, the DAILY JOURNAL, to keep people posted on the daily proceedings of the conference. "Business man will find it a valuable advertising medium". The DAILY JOURNAL will be published for six days with a circulation of 2,000 copies daily. Fifteen cents for the week or 3 cents per copy. The C.W. & M. railroad is preparing to build a plank sidewalk from their track north of the depot to the grounds in Harter's grove for the transfer of baggage and passengers coming to attend the Dunkard conference." To and hospitality in entertaining us as they have. To the railroad companies and their agents. To the Committee of Arrangements for the supply of all our wants. 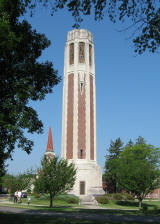 The Conference was held in the eastern part of Harter's Grove (today Warvel Park). People began to gather on Friday, June 1 with some worship and preaching services on Sunday, June 3. Again, many Brethren preachers held services in local churches. "In addition to the services in the tabernacle, the pulpits in the United Brethren, Lutheran, and Methodist churches were filled by the visiting Brethren and the various places of worship were filled to overflowing at every service." Sunday was the biggest day of the conference. Estimates of the Sunday crowd ranged from 40,000 to 50,000. "The largest crowd that was ever seen in the little city of North Manchester was on the annual meeting grounds. Early in the morning rigs of all descriptions began to arrive from the surrounding country and neighboring cities, towns and villages. Carriages, buggies, road wagons, spring wagons and farm wagons filled to overflowing came pouring in from every direction, and each was loaded to its utmost capacity. The streets and sidewalks were soon little less than a great moving mass of activity. Excursion trains soon began to arrive and a huge mass poured into the grounds from them." The Dining Hall seated 800 people. There were 45 cooks and 75 waiters. The daily demand was for 1900 pounds of bread, 150 dozen eggs, 600 pounds of ham, 25 bushels of potatoes. Thirty-one 1200 pound beeves had been killed to Monday of the meeting. Besides the Dining Hall, there was a lunch room 18 x 150 feet, arranged to serve people on both sides. It is a "model of its kind." The oldest man on the meeting ground was Addison Sebring of near Silver Lake, born in March of 1800 and a little over a hundred years of age. He was well acquainted with Gen. Harrison and had seen Henry Clay and Thomas Jefferson. I. J. Morris, the oldest resident of Warsaw was in town. He knew North Manchester when Peter Ogan's cabin was the only house in town. F. J. Bechtold & Co.'s new soda parlors and drug store were open all night during the big meeting. There were two newspapers in North Manchester; both published daily editions during the conference. In order to avoid "conflict of interest", the MORNING JOURNAL published in the morning and the DAILY RAYS OF LIGHT appeared in the afternoon. The railroads helped. The Big Four road ran an excursion train of forty cars here for Sunday from Dayton, Ohio. The Wabash railroad (Vandalia) arranged to build a platform 1,000 feet long beside its track at the entrance of the grounds where all trains stopped, thus permitting passengers to alight at the very entrance of the grove. Calvin Ulery had charge of the bicycle checking stand on the annual meeting grounds. The charges were very reasonable and all wheels were carefully looked after while in his care. It was necessary to check all wheels taken to the grounds as no one was allowed to ride on the grounds. "It is said there were 50,000 or 60,000 people at North Manchester last Sunday at the big Dunkard meeting. After eating out the boarding houses and everything else in sight they spread out over the country and surrounding towns in search of victuals. This is the misfortune of pulling up the meeting from Peru after it was located here and taking it out into a little country town." "The Sunday crowd was good natured and the best of order was maintained. The day was pleasant, the exercises novel, the crowd simply immense and the sentiment of the excursionists is that they had an "awfully nice time." It is conservatively estimated that 4,000,000 bags of peanuts were eaten Sunday and enough lemonade drank to float the United States navy. The committee paid out something over $6,000. Butter, $300, Fruit, $1200; Bread, pies, buns and other bakery goods, $900; Beef cattle, $1600; Other meats, $400; Potatoes, pickles, apple butter, etc. $150; Milk, $50." Remember the population of North Manchester was 4,000 at that time. "Not only did the great gathering do the town much good from the very considerable amount of money spent here, but it has proven an inestimable advertisement for the place. People were here from nearly every state in the union and the attendance from those states having a large Dunkard population was immense. These people have gone home feeling that they were excellently treated and that their lines had fallen in pleasant places. These visitors will have a good word for North Manchester. They not only were pleased with the town but say that the arrangements for the meeting generally were superior to any they ever attended."